The Seattle Review of Books - Talking with Mita Mahato about Short Run, the "perfect model of a festival"
Talking with Mita Mahato about Short Run, the "perfect model of a festival"
Back in August, I interviewed Short Run Festival cofounder Eroyn Franklin about her decision to step down from leadership of the small press, zine, and comics expo. With this year's Short Run Comix and Arts Festival around the corner — events are happening all week long, with the big show arriving this Saturday — I wanted to interview current Short Run leadership about what to expect at this year's festival and in the years ahead. Aside from Franklin and Short Run cofounder Kelly Froh, Mita Mahato is probably the local cartoonist most associated with the festival. Mahato, who makes beautiful cut-paper comics that are unlike anything anyone else is doing, has slowly become an indispensable part of Short Run. We'll be running more interviews with Short Run board members throughout the day, so check back for more previews of the festival this aternoon. When did you join the Short Run board? I was brought onto the board back in 2014 when when Kelly and Eroyn applied for nonprofit status for Short Run. I had been exhibiting since the second year of Short Run. For me, coming into the comic scene in Seattle, it was just such an exciting community. There's so much support and so much excitement about everybody's projects and I knew that Short Run was a big part of that. So when Kelly and Eroyn started talking about making it a fully fledged organization that's largely women-run, that was just really exciting to me. So I became a part of the board and served as secretary. When Eroyn left, Kelly and I talked about whether it made sense for me to move into the role of chair. And that's the role that I've been in this past year. A few months ago, I did a sort of exit interview with Eroyn about leaving her role at the organization. So could you talk a little bit about what it's been like working on Short Run without her for the first time? I think one of the big things is that we collectively decided that we don't want to change. Kelly and Eroyn developed the perfect model for a festival back before it was even an organization in 2011, and so a lot of what we're doing as a board is trying to maintain the vision of that. We want to keep Short Run a place for voices and perspectives. And when I say "voices and perspectives," I mean in aesthetics as well as personal backgrounds that we don't see in mainstream or widely publicized comics. And so a lot of what we've been doing since Eroyn has left is trying to kind of cultivate that vision, especially as the organization is growing. We have our opportunity to bring in bigger names, but we also want to make sure that we're finding ways for new voices and underrepresented communities to have inroads and a platform at Short Run. Can you talk a little bit about what you're looking forward to at this year's festival? Bearing in mind, of course, that the exhibitors are all your babies and you love them all equally. What I'm really excited about is we're sponsoring a teen table at this year's fest. We're going to have teens from Foundry 10 and the Henry Teen Art Collective sharing a table and showcasing their projects. It's such an exciting opportunity to have them share their work with other exhibitors to get some informal mentoring. And something that I'm really excited about, too, is that it gives the opportunity for the teens and kids who are coming to the show to see that this is something they can do, too. We're trying to expand our education programming and reach out to the next generation of comics- and zine-makers, so we're really excited about the teens being there. And you specifically are debuting a new book at the festival, right? I am, which is the main thing that I'm spending my time on today. 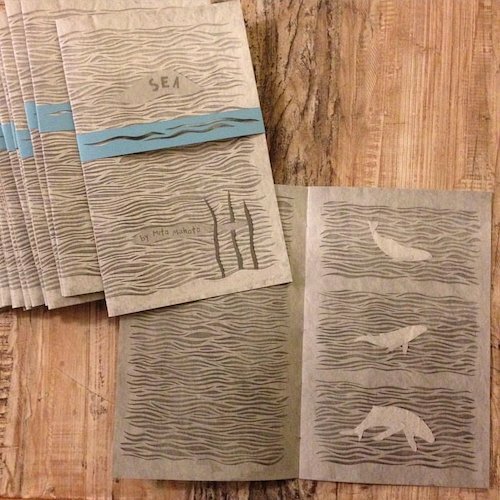 I conceived of it initially as a sequel to my book, Sea, which I made in 2015 and which was very much about honoring the silence of the seas and trying to get out of the way we communicate as humans by thinking about how whales communicate . I was, as I think many of us were, deeply affected by the story of the Orca, J50 the Orca baby, and her mother's grieving. I was trying to figure out what my response was to this. And so it's a book similar to Sea but instead of silence it's acknowledging the noise and the undeniable presence of humans when it comes to the oceans. It's called Lullaby and it is one of the saddest things that I've worked on.